MARCOM's "Driving Safety" Video Program provides the information employees need to drive cars, vans and small trucks safely, both on and off the job. Most employees travel the roads every day... in cars, vans or trucks... many of them on company business. 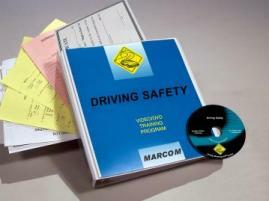 Each year, traffic accidents claim over 30,000 lives and cause more than a million serious injuries. In fact, motor vehicle crashes are the number one cause of death on the job. The videotape includes information on inspecting the vehicle, adjusting seats, mirrors and other equipment, wearing seatbelts, mental preparation and concentration, creating a "safety cushion" around your vehicle, passing another vehicle, driving at night, adverse weather conditions, skidding and hydroplaning, what to do in case of an accident, and more. The video program comes with a comprehensive leader's guide, reproducible scheduling & attendance form, employee quiz, training certificate and training log.